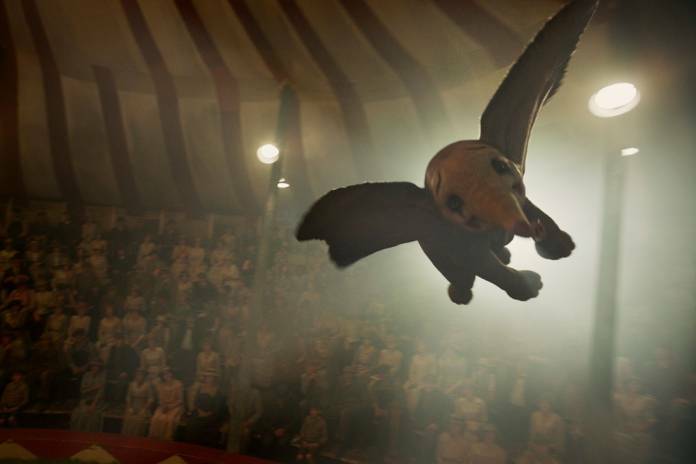 During the first half of the press conference for the highly-anticipated live-action reimagining of Disney‘s Dumbo, we got to learn more about how composer Danny Elfman came to the project. Most importantly, we learned how he created Dumbo’s theme and managed to capture director Tim Burton’s need to hear Dumbo soar in the film’s score. While there are plenty of moments in the story of Dumbo that possess the bittersweet sadness that Elfman is drawn to in his composing, his collaboration with Burton in ensuring that we can soar along with Dumbo when we listen to the score proves, once again, that they truly are a match made in creative heaven. Dumbo stars Colin Farrell, Michael Keaton, Danny DeVito, Eva Green, Alan Arkin, Finley Hobbins, and Nico Parker. Directed by Tim Burton (Alice in Wonderland, Charlie and the Chocolate Factory) from a screenplay by Ehren Kruger (Ophelia, Dream House), and produced by Justin Springer (TRON: Legacy), Kruger, Katterli Frauenfelder (Miss Peregrine’s Home for Peculiar Children, Big Eyes) and Derek Frey (Miss Peregrine’s Home for Peculiar Children, Frankenweenie), Dumbo flies into theaters on March 29. Next articleNew Spider-Man: Far From Home Posters Have Arrived!